City Management and its partners put the city centre of Hamburg in the spotlight in a very special way with the Binnenalster Film Festival. A floating canvas directly over the Inner Alster Lake transforms the Jungfernstieg into an impressive open air cinema. Viewers can enjoy movies with the onset of dusk starting at 8:30 p.m. while sitting on the steps of the Jungfernstieg. Fine dining will ensure physical well-being. Admission is free of charge for all visitors. 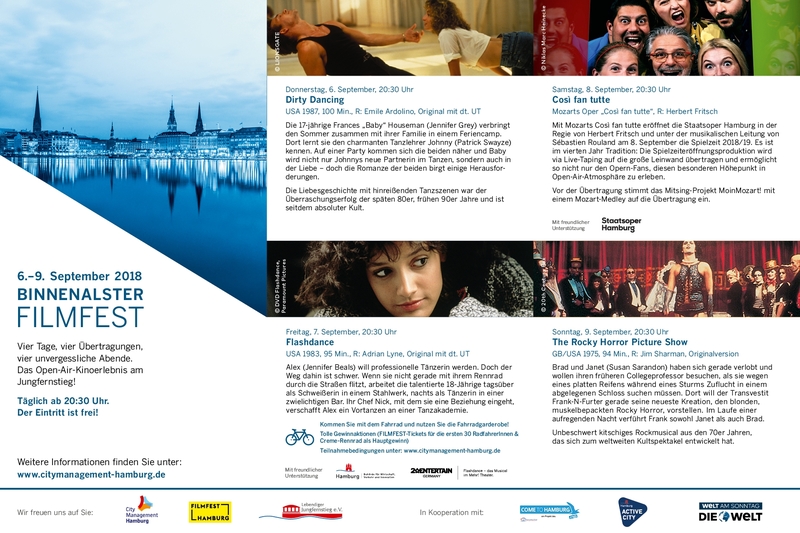 The Binnenalster Film Festival is a good reason to visit the city after business hours or at the end of a shopping day.